Goodwill Current Openings | Find work and help build your community! Join the Goodwill® team and make a difference! Know that when you work in our offices, retail stores, donation centers and programs, that you are helping others make strides in their careers and improving the lives of their families! We look forward to working with you! This employer participates in E-Verify, please click here for additional information. Check back for upcoming Job Fairs! 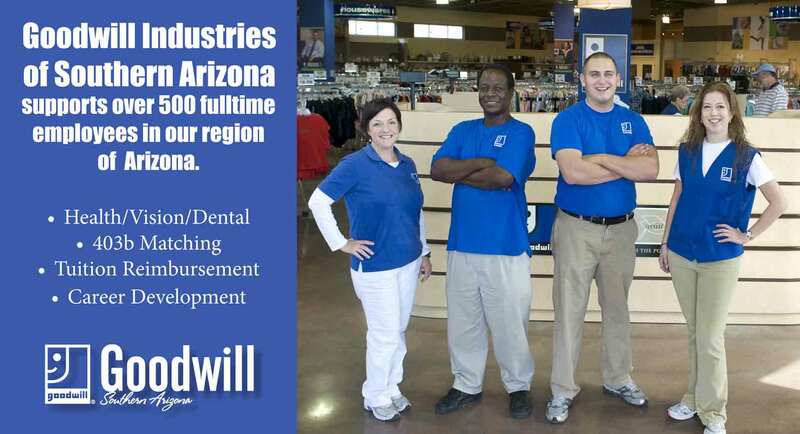 Goodwill® Industries of Southern Arizona is an Equal Opportunity employer. It is the policy of Goodwill® Industries of Southern Arizona, Inc. (GISA) to afford equal employment opportunity to all people, regardless of age, race, color, gender, sexual preference, religion, national origin, disability, veteran status or any other non-job related characteristic. Equal opportunity and equal consideration will be given to all applicants and employees in employment matters, including recruitment, hiring, training, promotion, compensation, transfer, lay-off and termination. We view the principle of equal employment opportunity as a vital element in the employment process. Current Goodwill® Employees can apply for any available position here. Please note: external applications WILL NOT be accepted through this link. If you are an external applicant seeking employment with Goodwill®, please apply to one of the open positions listed at the top of this page. Thank you. Goodwill® Industries of Southern Arizona is committed to providing access to its website for everyone. If you use assistive technology (screen reader, Braille device, etc.) and the format of the materials on this site interferes with your ability to access the information, please contact Human Resources.